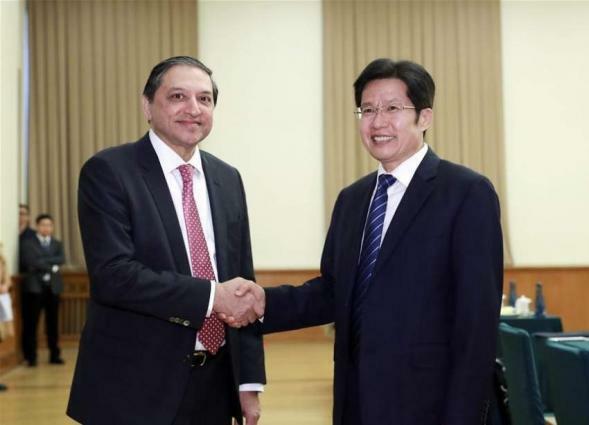 ISLAMABAD, (UrduPoint / Pakistan Point News - 16th Apr, 2019 ) :Senate Deputy Chairman Saleem Mandviwalla Tuesday held a meeting with Chinese People's Political Consultative Conference (CPPCC) Vice Chairman, Gao Yunlong in Beijing and expressed satisfaction over the bilateral relations between Pakistan and China and discussed ways and means to further cement bilateral ties. He said Pakistan wanted continuous development of bilateral relations in various fields. The CPPCC vice chairman hosted welcome dinner in the honour of the Senate deputy chairman and his delegation. Pakistani ambassador Khalid Masood was also present. A four-member delegation of Senate comprising senators Abdul Qayyum, Sassi Palijo and Liaqat Khan Taraki is visiting China to attend launch of Annual Development Report 2018 of Belt and Road Initiative.